Did you know that May is Burger Month? Well, in all my burgerness it slipped me by, but fortunately Burger City Grill was there to remind me and to invite me out to try a burger, fries and a drink. I decided to take them up on the offer and headed to the location in Downey to see what Burger City Grill was all about. What I found was a fast casual sort of burger spot along the lines of a Smashburger, Hook Burger and Burger Lounge (sorry, but Shake Shack is in a class of its own). There were some interesting takes on burgers, fries and the required milkshakes and beers. 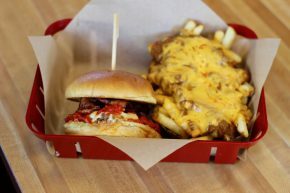 After much thought, I chose the Miami Spice Burger and Sloppy Fries.